In the first half of 2011 alone, 1172 fire cases were reported in Bengaluru (BBMP) limits, says a top Karnataka fire department official. Following the High Court’s ruling on a PIL filed by the Beyond Carlton group, the state government issued a notification on July 7 this year. The notification mandates co-ordination between BBMP and the state’s Fire and Emergency Services department to check for fire safety in high rises. High rises (buildings with height above 15 m) are supposed to abide by safety norms of BBMP’s building bye-laws, RMP (Revised Master Plan) and NBC (National Building Code). Unlike earlier, the new notification authorises the fire department to inspect buildings routinely and to impose penalties/suspend services in case of non-compliance. To get plan sanction, builder should submit an NOC from Fire department to BBMP. After construction, Fire department will inspect the building and give a Clearance Certificate (CC). BBMP will give Occupancy Certificate (OC) for the building only after the CC is issued. Fire Officers (FOs) of the rank of District Fire Officer or above will inspect buildings once every two years, along with a representative of residents/tenants, and give a report. The residents’ representative will be notified seven days before the inspection. FO will issue a Fire Safety Certificate which should be presented to BBMP for permission renewal once in two years. Residents should also have their buildings inspected by agencies empanelled by the fire department. This inspection report along with an affidavit on condition of fire safety system should be submitted to BBMP and fire department once every two years. Additionally, there will be surprise inspections. » Builder should get Fire department NOC before BBMP’s plan sanction. On violations, Fire Officer will send a notice to residents giving them three months’ time to comply. If they do not comply or respond, FO can ask BESCOM to disconnect power supply to the building. FO can also seal the building and ask BBMP to suspend the building’s OC. After this entry and exit to the building would be allowed only for completing the work. On completing the work, residents can intimate FO. If satisfied on re-inspection, he can ask BESCOM to restore power and allow entry/exit into the building. But residents will have to get fresh OC from BBMP by producing Fire Safety Certificate. Builders who violate norms after getting the initial NOC can be criminally prosecuted under Fire Services Act, 1964. Existing high rises which do not have NOC and BBMP’s Commencement Certificate (issued before construction starts) will be cleared only if there are no violations. Even then they have to pay four times the current government fee as penalty. Non-complying buildings will not be entitled to Sakrama. The new rules are effective from July 7, 2011. Fire department to inspect all high rises in the city and state within nine months of the notification. All government high rises to have fire safety systems in place within one year of the notification. Arathi Manay Yajaman and O P Ramaswamy were trying to reverse the penalty levied by BESCOM for supposedly exceeding the load sanctioned load for their apartments. But they managed to reverse it for the entire city. Residents are worried that builders are not ensuring that the STPs function well and comply to standards. KPSCB chairman Sadashivaiah promises to redefine STP norms and STPs certification by March. 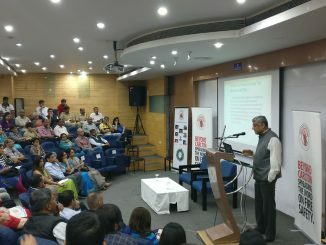 To create awareness about fire safety and reduce risks, it is important to sensitise the youth through creative campaigns – in schools, colleges and elsewhere, said Professor Rajiv Gowda at the 2018 annual memorial lecture organised by Beyond Carlton. Interesting. What provisions are in place that this does not become another area where people have to shell our bribes? Fire safety is required, not improving income of officials and their chain of bribing. Want an analogue of similar provisions gone bad – ever heard of the Electrical Inspectorate? Go ask any building manager about the goals of the electrical inspectorate. I have. The answer is … getting bribes. Also note that electrical safety has a direct bearing on fire safety also.